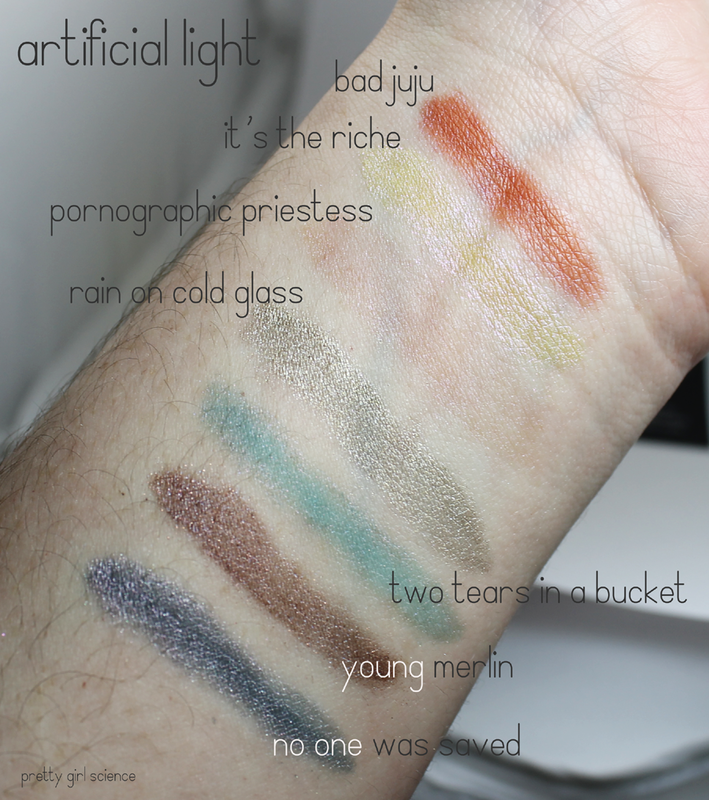 Just when you thought it was safe to come back to a nail blog...I have more indie makeup! Yes, I'm still slogging through the samplers I bought. I'm slow. I am almost finished though, so soon the indie hauls will be much smaller...yeah, keep telling yourself that, Nichole. 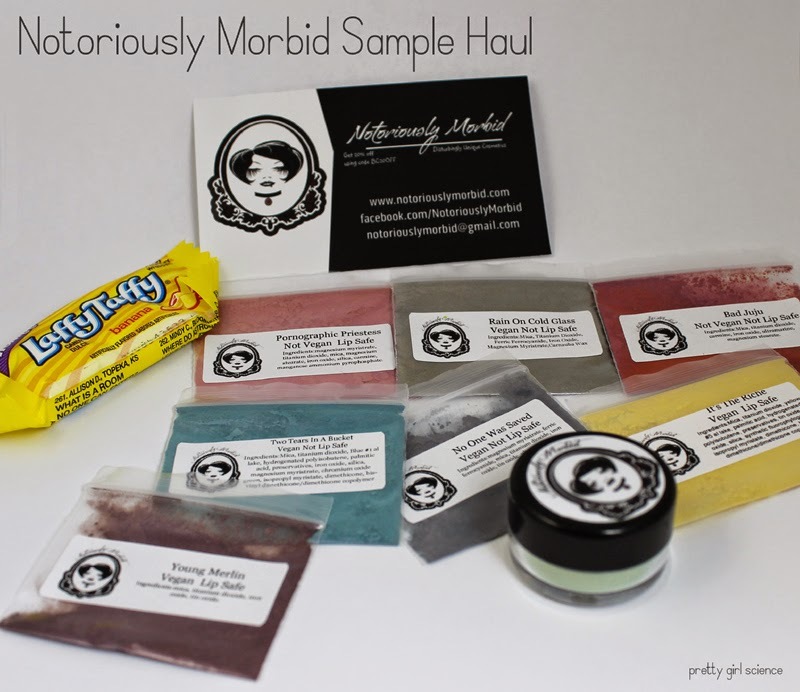 Today I've got Notoriously Morbid, and it has been a beautiful afternoon at Casa de Nichole. I was completely bribed with banana Laffy Taffy. It is my favorite of favorites. So I say buy all the things! Seriously though, these are pretty badass shadows. I am amazed at how they are both delicate and bold. Before applying them, I figured that Young Merlin would probably get the most use, but I think I have changed my mind. Rain On Cold Glass is a pretty amazing everyday color. I am by no means an expert at makeup application. I have the right tools, but my skillz aren't top-notch. (yet. one day...) These shadows blend so well together it is amazing. Not so easy that the colors get super muddy, but smoothly...as though they have a mind of their own. It is easy to make even the most contrasting colors blend seamlessly together. Very few powders have behaved like this for me. I generally only have this kind of luck with cream products. I have been blown away by the brands I have tried so far, and this one is really no different. I love the cleverness of the names, the packaging, and the whole aesthetic. 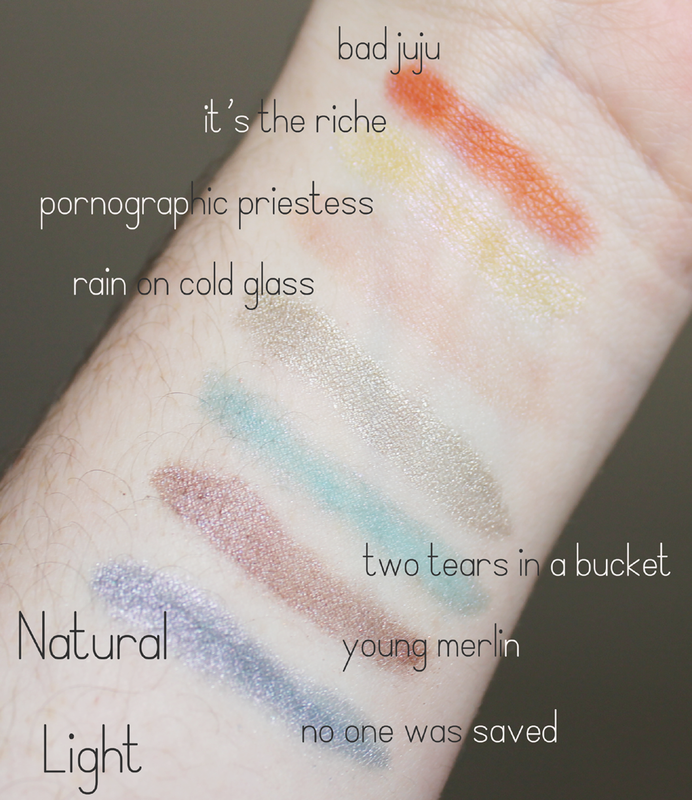 Indie brands are really ruining Sephora and Ulta for me, guys. Tragic. And now, my face! I used No One Was Saved and Rain On Cold Glass. I love these two colors together, especially with my eye color. 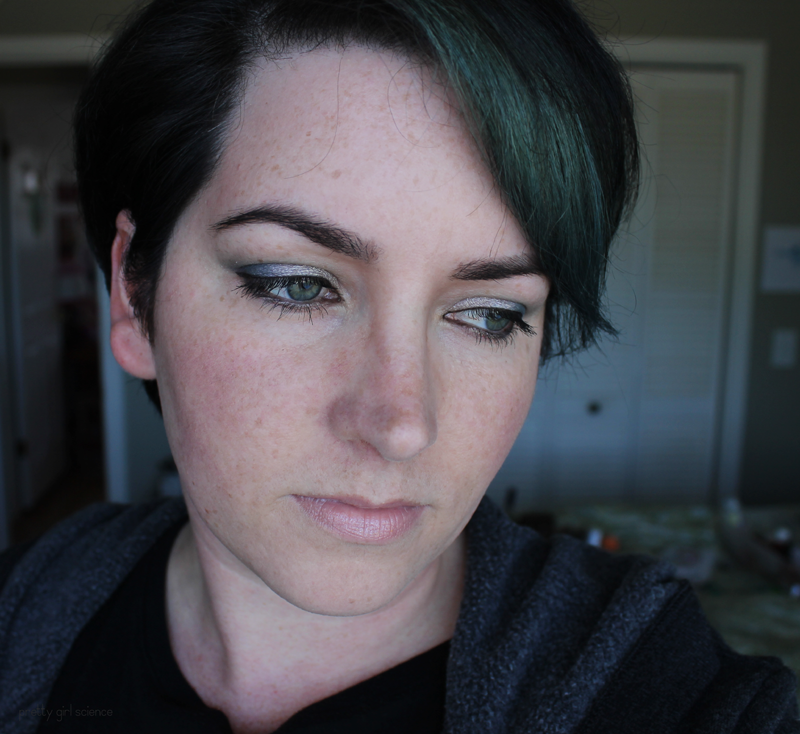 (I'm trying out a sample of MAC Studio Fix foundation in NC15. It looks ok in person, but it looks a wee bit yellow in the picture below. I don't know what to do! But I am loving the finish and coverage of this stuff. It feels nice, and covers a good deal of my redness. Maybe I should try the NW15?) These shadows blend so nicely together that the finished effect looked a bit like a duochrome. I want to try No One Was Saved with black next time, I think. It's a lovely icy slate, and it needs some black to make it pop out. Wow! The blending is so beautiful. it is! I wish I could take some credit...these shadows do a lot of the work. Rain on Cold Glass looks so great! thanks:D I love it. It might be my new favorite eyeshadow.